Moisture, Mold and Mildew 141 Appendix C: Moisture, Mold and Mildew Molds and mildew are fungi that grow on the surfaces of objects, within pores, and in deteriorated materials. They can cause discoloration and odor problems, deteriorate building materials, and lead to allergic reactions in susceptible individu- als, as well as other health problems. The following conditions are necessary for mold growth to occur on surfaces: ■ temperature range above 40°F and below 100°F ■ mold spores ■ nutrient base (most surfaces contain nutrients) ■ moisture Human comfort constraints limit the use of temperature control. Spores are almost always present in outdoor and indoor air, and almost all commonly used construc- tion materials and furnishings can provide nutrients to support mold growth. Dirt on surfaces provides additional nutrients. Cleaning and disinfecting with non- polluting cleaners and antimicrobial agents provides protection against mold growth. Other sections of this document have discussed the importance of building maintenance and proper sanitation in preventing IAQ problems. However, it is virtually impossible to eliminate all nutrients. Moisture control is thus an important strategy for reducing mold growth. Mold growth does not require the presence of standing water; it can occur when high relative humidity or the hygroscopic properties (the tendency to absorb and retain moisture) of building surfaces allow sufficient moisture to accumulate. Relative humidity and the factors that govern it are often misunder- stood. 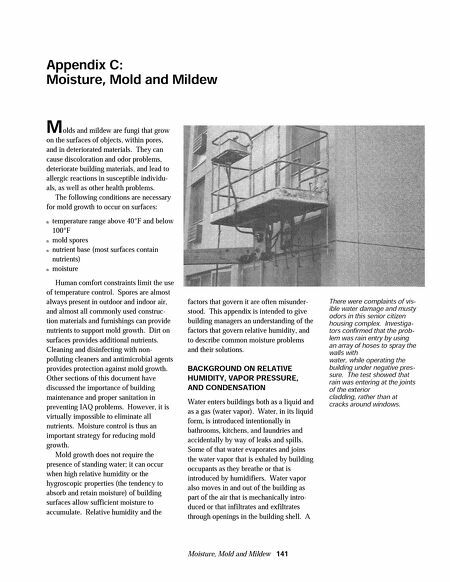 This appendix is intended to give building managers an understanding of the factors that govern relative humidity, and to describe common moisture problems and their solutions. BACKGROUND ON RELATIVE HUMIDITY, VAPOR PRESSURE, AND CONDENSATION Water enters buildings both as a liquid and as a gas (water vapor). Water, in its liquid form, is introduced intentionally in bathrooms, kitchens, and laundries and accidentally by way of leaks and spills. Some of that water evaporates and joins the water vapor that is exhaled by building occupants as they breathe or that is introduced by humidifiers. 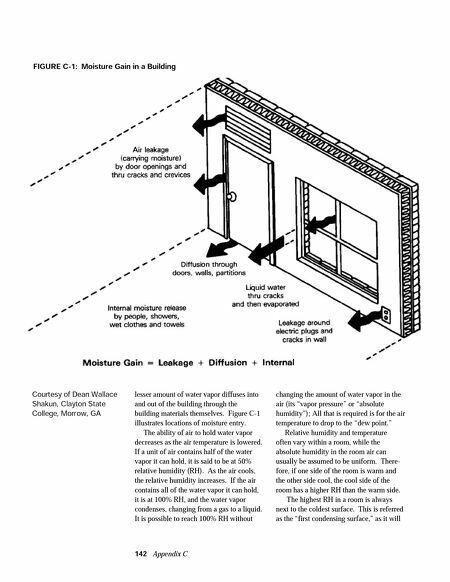 Water vapor also moves in and out of the building as part of the air that is mechanically intro- duced or that infiltrates and exfiltrates through openings in the building shell. A There were complaints of vis- ible water damage and musty odors in this senior citizen housing complex. Investiga- tors confirmed that the prob- lem was rain entry by using an array of hoses to spray the walls with water, while operating the building under negative pres- sure. The test showed that rain was entering at the joints of the exterior cladding, rather than at cracks around windows.